Siloam was spearheaded by the compassionate drive of German Christians. Motivated to help people suffering from blindness in India, they realised that many could be cured by a simple cataract operation. They were also concerned about giving people spiritual sight through the Gospel. The mission first began working in 1971 with a dedicated team of Indian ophthalmologists. It rapidly expanded through a network of Evangelical Pastors who set up medical centres and children’s hostels along with church activities. ‘Siloam’ means 'sent' and Siloam Christian Ministries is sent to those who need the love of God expressed through medical aid, education and social relief. Siloam received charitable status in 1986. It soon established a presence in many parts of the world by working with a number of independent co-workers and national churches. Also, Siloam is affiliated with Childcare Worldwide (CCW) and other established overseas partners. A member of the Evangelical Alliance, Siloam Christian Ministries adheres to the EA Statement of Faith. Today Siloam sponsors more than 40 wide-ranging projects overseas and in Britain. These sustainable projects are always developed through on-the-ground partnership with local workers. Siloam helps many independent missionaries who don't attract the attention of larger charities. Stay in touch through our website and other electronic media. You can pray and pass on our newsfeeds to others. Also, donations, however small, can help alleviate the suffering of others. ‘Siloam aims to help the needy, not only to survive, but also to succeed,’ explains UK Director Richard Norton. Medical relief is extended to those in dire need, whether they suffer from leprosy, blindness or AIDS. Throughout areas as different as Africa and Asia, relief aid together with educational opportunities provides an escape route from poverty. Baby and children’s rescue centres work together with local authorities in caring for the vulnerable and rescued victims. Child sponsorship for as little as £10 a month enables future security. Success stories include graduates who then sponsor the next generation of those at risk – proof that being sent to help can become shared love. Our organisation chose the name Siloam Christian Ministries because the mission began its work by helping blind people in south India suffering with cataracts recover their eyesight. The Greek word 'Siloam' is a place name possibly derived from the Hebrew word 'Shalom'. The word means 'sending the Spirit'. The pool of Siloam is the place where the blind man was told to go and wash as Jesus had spat on the ground and mixed His saliva with the mud, which he put on the blind man's eyes. It's really a play on words to press the point that the blind man was sent to Siloam by Jesus, whom God had sent Himself. To regain his sight, the blind man went to the pool of Siloam and washed and so obeyed the words of Jesus. The whole account is recorded in John: 9, 1-11. The pool of Siloam is situated on the southern end of the old city of Jerusalem at the end of Hezekiah's conduit which was constructed around 700-710 B.C. 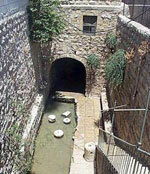 The conduit was cut out of solid rock to safeguard the water supply for the city of Jerusalem which at that time was being threatened by the Assyrian Army. A small boy discovered the celebrated Siloam inscription in 1880, by accidentally falling into the water. Upon rising to the surface, he observed some writing on the rock above on one side of the channel. It is reported that Herr Schick took an impression of these letters which he deciphered to be ancient Hebrew. Indeed, this remains to be the oldest specimen of alphabetical writing ever found. Siloam retains the name because of its commitment to the blind in India by sponsoring eye operations, glaucoma and other ophthalmic treatment at the Siloam Thomas Eye Hospital in Coimbatore - see project 009.